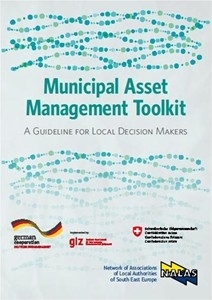 29 July 2015 – The Municipal Asset Management Toolkit – Guidelines for local decision makers, Regional report on practices in the field of asset management and Report on international practices in the field of municipal asset management have been prepared within the project “Asset management in the area of water supply and waste water treatment in South East Europe”, financed by the German Ministry for Economic Cooperation and Development and the Swiss Government, and implemented by the GIZ Open Regional Fund for the Modernization of Municipal Services and the Network of Associations of Local Authorities of South East Europe (NALAS), in cooperation with local government associations including the Union of Municipalities of Montenegro. – Gradually introducing asset management practices as part of everyday activities. The toolkit should enable readers to identify gaps or challenges, and draw up a strategy for addressing these challenges using information and other resources assembled for this purpose.